NEW! THE Dream Machine 2 - is this the ultimate sewing machine? Home » Brother » Brother THE Dream Machine 2 » NEW! THE Dream Machine 2 – is this the ultimate sewing machine? NEW! THE Dream Machine 2 – is this the ultimate sewing machine? This week starts with a day of dreams. What better way to start this week than with the unveiling of THE Dream Machine 2 from Brother. From the time I opened the box and saw the beautiful gleam of white and blue, and removed the machine and the accessories one by one, it has been a cloud 9 experience. I’m truly going to love sharing my experience of this machine and its functions with you. THE Dream Machine 2 is on display in my studio and ready to play. While this machine offers so much to the quilter and embroidery stitcher, this week I’ll be talking about the features related to general stitching. The embroidery features of THE Dream Machine 2 will be shared in the set of blog posts in the months that follow. Meanwhile, I love notions and gadgets. With that being said, one of the first things that really stood out to me was the useful accessory box that came with THE Dream Machine 2. This stylish storage unit has everything at my fingertips when it comes to finding what I need to work on my projects. There’s a smorgasbord of accessories included with the machine including a wonderful assortment of feet I’ll show you this week. I can verify that the ¼” foot is a perfect ¼”. As a quilter, it’s always the first foot that I test on a new machine. I’m excited about testing the other feet and some of the more than 100 frequently used stitches that are programmed on this machine. 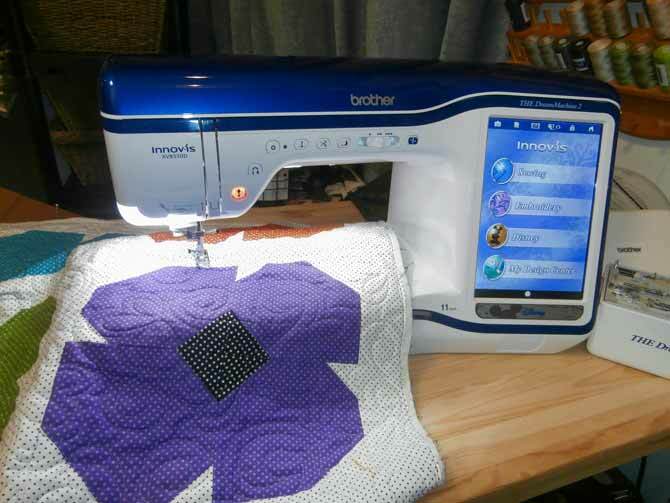 And of course, this machine also allows you to create your own custom stitches to personalize your projects. You’re probably wondering about how user friendly this machine can be since it offers so many features. 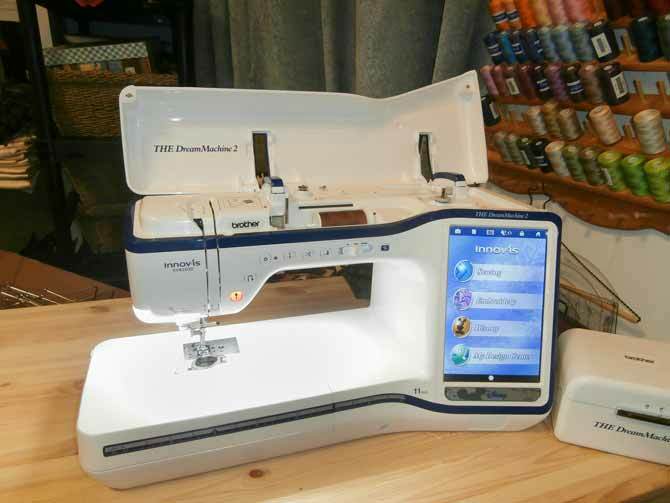 I can tell you that from the first time I turned the machine on, I felt that THE Dream Machine 2 was very easy to work with regards to the basic functions of bobbin filling, needle threading and the all over initial attempt to become familiar with the machine in my first sitting. Honestly, the needle threading feature is my favorite so far; what a breeze! Follow me this week, as I’ll be testing and sharing many wonderful features with you in the blog posts and again during my blog posts in July and August. I will also be working on a new project this week in order to experiment with the different feet and stitches. 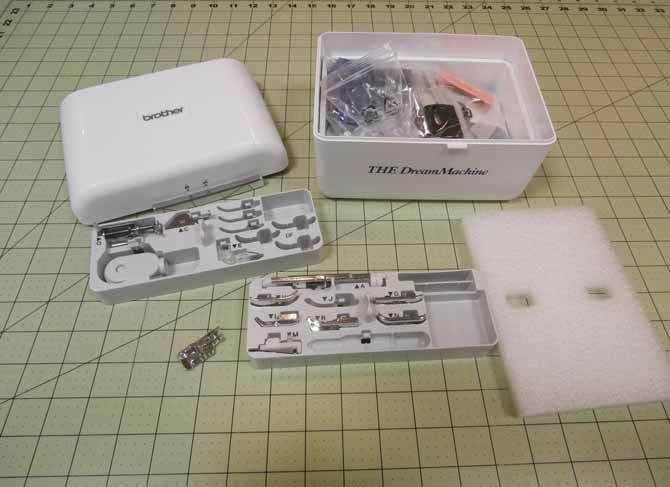 Tomorrow I’ll be reviewing some key features of the THE Dream Machine 2. In the meantime, here’s a video you’ll want to watch as a quick overview of this extraordinary Brother sewing machine. Until then, HAPPY STITCHING! Watch to learn about the new THE Dream Machine 2 by Brother.